Award-winning architect Gil Schafer III, AIA has focused his career on residential projects for the past thirty years. Prior to establishing G. P. Schafer Architect, PLLC in 2002, Gil worked in several distinguished traditional residential architecture practices including Ferguson Murray & Shamamian Architects, where he remained for nearly a decade, and worked on large-scale projects in places including Tulsa, Palm Beach, and Nashville. In fact, over the course of his career, Gil’s work has involved him in projects in numerous and varied locations around the country and abroad, and in scales ranging from under 1,000 square feet to nearly 40,000 square feet. The grandson and great, great grandson of architects, Gil grew up with a strong sense of how a well-built, thoughtfully-designed home can bring pleasure to daily life. Over the course of his childhood he was fortunate to be exposed to life in a variety of places, including the Midwest, the Northeast, Georgia, California and the Bahamas, each contributing to his sense of what makes places unique and how architectural traditions and lifestyle are influenced by context. Following undergraduate studies in Growth & Structure of Cities at Haverford College and its sister institution Bryn Mawr, Gil graduated from Yale School of Architecture with a Masters Degree in 1988. While at Yale, Gil studied under several noted practitioners including Thomas Beeby, Robert Venturi, Josef Kleihues, Frank Gehry, and Benard Tschumi and was the recipient of the H. I. Feldman Prize, Yale’s highest honor for studio work, in his final semester. 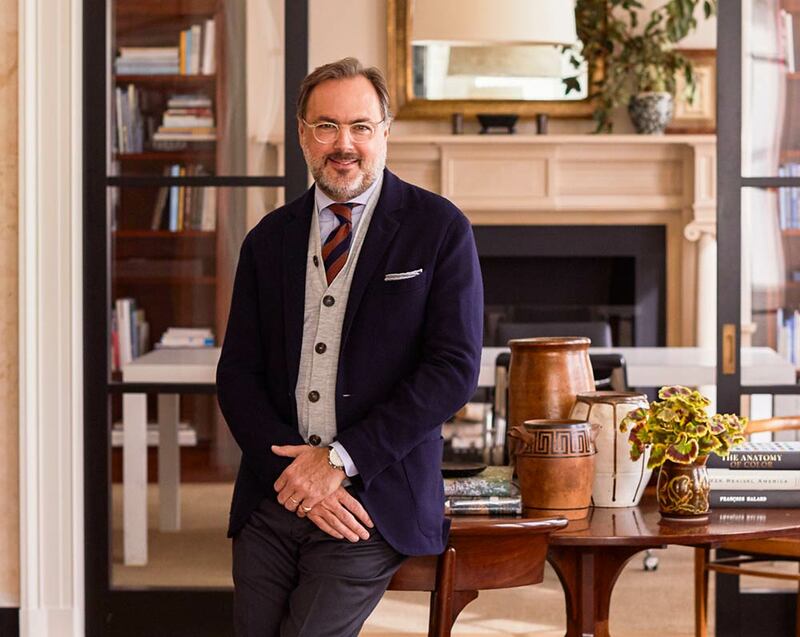 In addition to his architectural practice, Gil lectures around the country on the relevance and livability of traditional residential architecture today and is the author of two bestselling books, The Great American House and A Place to Call Home. He is a member of Architectural Digest’s AD100 and winner of Veranda’s “Art of Design Award.” His work and the firm’s projects have been widely published both here in the U. S. and abroad in both magazines and newspapers, including Architectural Digest, Elle Décor, House Beautiful, Veranda, Town & Country, Country Life, The New York Times and The Wall Street Journal, among many others. Gil serves on several non-profit boards and advisory councils, including the Yale School of Architecture’s Dean’s Council, the Dutchess Land Conservancy, and the Thomas Jefferson Foundation at Monticello. From 1999 – 2006 Gil served as the President and then Chairman of the Institute of Classical Architecture & Art, the nation’s leading resource for the classical tradition in architecture and its allied arts. Gil and his family divide their time between New York City, the Hudson Valley, and the coast of Maine. Gil currently maintains architectural licenses in New York, New Jersey, Connecticut, Florida, Massachusetts, Maine, Virginia, Tennessee, Rhode Island, Vermont, Georgia, and Arkansas and is certified by the National Council of Architectural Registration Boards (NCARB).